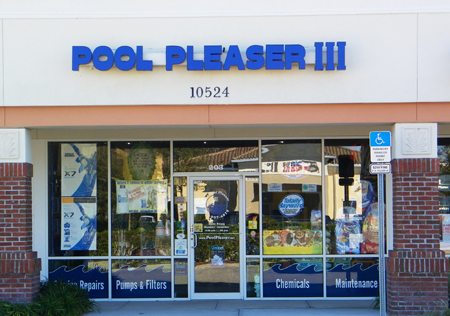 The Pool Pleaser has 3 convenient locations to serve your pool maintenance needs. Our main store resides in Pine Castle in South Orlando on Hoffner Ave, our Dr. Phillips location in southwest Orlando is located in The Marketplace on Della Dr., and our newest store in Lake Nona in southeast Orlando is in the Lake Hart Shopping Plaza at the corner of Moss Park Rd and Narcoossee Rd. Contact us should you need us to accommodate any special needs outside of our regular store hours. SATURDAY: 8:00 A.M TO 4:00 P.M.
MON - FRI : 9:00 A.M TO 6:00 P.M.